A significant victory in social and legal battles against criminal animal rights activists happened very quietly in a courtroom this past Friday (6/26/2015). Kevin Johnson (“Olliff”) pled guilty to federal Animal Enterprise Terrorism Act (AETA) charges relating to the criminal sabotage of a mink farm that occurred in Illinois in 2013. 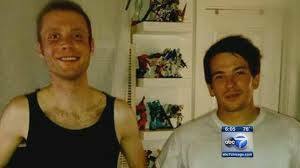 Kevin and his fellow animal right fanatic, Tyler Lang, were arrested while traveling in Illinois, not long after the release occurred. I discussed the circumstances of their arrest here. After months of fighting a losing battle to challenge the Constitutionality of the AETA and years of claims that they would never stop challenging their arrests (*WARNING: Animal rights website: SupportKevinandTyler.com *), Kevin has now plead guilty, and Tyler appears poised to do the same in the forthcoming days or weeks. For years, these two individuals were participating in neighborhood protests focused on UCLA researchers, including me (here, here and here). As I mentioned in an earlier post, this directly demonstrates the blurred lines between the people who propagate above-ground harassment and underground, criminal actions in the name of animal “rights”. Indeed, Kevin has already spent considerable amounts of time in jail for criminal harassment of UCLA researchers, including threats to burn down their homes and the intentional terrorism of their children. Some people continue to believe that many animal rights activists are merely disillusioned young people who will grow out of their problem behaviors. But cases like this show that the animal “rights” movement is made up a non-trivial number of recidivistic criminals who are determined to harm others in order to achieve their ends. So, while this first successful prosecution of animal “rights” terrorism under the enhanced penalties offered by the AETA is cause for victory (as will be Tyler’s presumably impending plea), it’s also a cautionary note. The fanatical animal “rights” movement undoubtedly contains many more people willing to commit heinous crimes to earn publicity and celebrity for themselves and their cause, and we must be ready, as a society, to take action against them whenever and wherever they do. On 7 March 2009, extremist elements in the animal rights movement bombed my car in an attempt to intimidate me and end the research that I conduct in my laboratory at UCLA. This was just one more event in a long line of horrific, violent and sometimes haphazard attacks propagated against UCLA neuroscientists by Los Angeles animal “rights” activists. 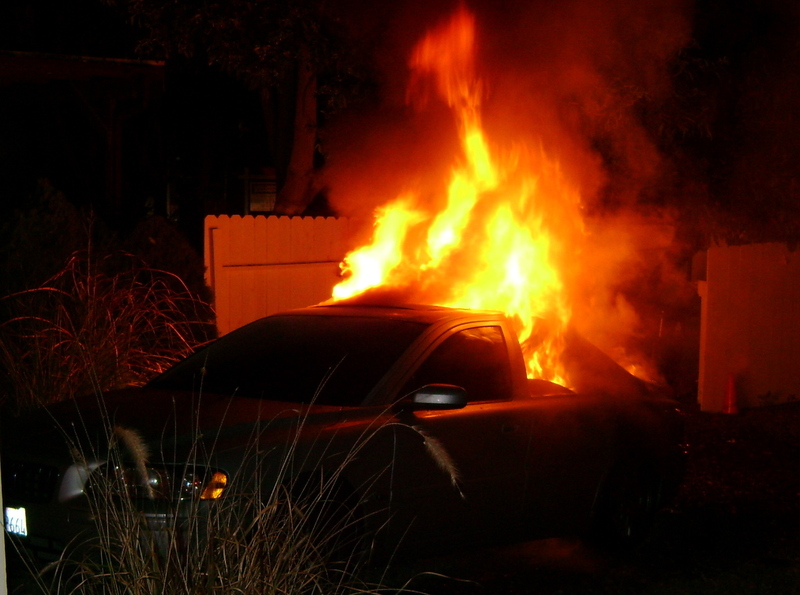 Car arson at my house on 7 March 2009. The Animal Liberation Brigade would claim responsibility for the attack 2 days later. Sadly, it was far from the most blood-thirsty action radical political extremists were to undertake in the US that month. Just a few weeks after my car was incinerated, a Wichita, KS, physician – Dr. George TIller – was assassinated by an anti-abortion fanatic while serving as an usher at church on the morning of 31 May 2009. Dr. Tiller’s long career providing essential health services to women in need was cut short. As has been noted before, there are extensive similarities in the tactics used by radical animal rights terrorists and anti-abortion groups like Operation Rescue. Threats, direct targeting, hatred, vitriol, lies and deception, arson, bombing and criminal violence are the currency that both groups spend readily. They intend to win by force, rather than by reason, civility or virtue. Their hollow arguments having failed to persuade the American public, they resort to intimidation to win their gambit. I am very familiar with Dr. Tiller’s murder for two reasons. First, I strongly support a woman’s right to choose, and on behalf of my mother, sisters and women everywhere, I was offended deeply by his murder. His assassination was intended to suppress other physicians and to stop women across America from being able to make decisions about their own bodies. Of course, animal rights extremists who targeted me had a similar goal in mind. They wanted to frighten researchers everywhere with a simple message: you could be next. Furthermore, they intended to deprive people across this country from the right to access the treatments that come from medical progress. I was also familar with Dr. Tiller because animal rights fanatics began sometimes referring to me as David “Tiller” Jentsch, implying that I would come to share his fate. The perverse writings online revealed the deep psychopathology of animal rights individuals and exposed their hatred and death fetishes. Since then, they have targeted me continuously. They have harassed my students; they have sent me “AIDS-tainted razor blades” in the mail; they have launched phone/mail/email campaigns against my department; and they have engaged in repeated, and often criminal, protests intended to intimidate me at my home. Picketers demonstrating in the street in front of my home. Contrary to the intentions of animal extremists, the scope and impact of my research has grown and proliferated. Yes, their hatred has caused me fear, resulted in endless loss of time and productivity and represented a real and significant impact on my work. But their hatred has only strengthened my resolve and determination to make the kinds of scientific contributions that I know that our society needs and wants. In 2009, the misanthropic face of the pro-life movement was exposed by the murder of Dr. Tiller, and it was then rejected by many across this country. A corner was turned, and a door was closed on Operation Rescue. It is time for a similar development in our struggle against fanatical animal rights elements. People’s lives are being ruined, and the scientific community remains mostly silent. We must throw light on the pathology of the animal rights movement and move strongly to swell social support for our responsible work. Sadly, there is much left to do on the part of rational scientists and the public who benefits from our work. I continue to urge that we collectively do more than we do today. And in the mean time, I am still here and no fanatic can change that. What an articulate, clear and truthful defense of the importance of humane, responsible and regulated animal research. I urge students involved in biomedical research across the world to do what Mr. Cordy has done and communicate the importance of our work to the broader public. The following post was originally published in The Daily of the University of Washington on April 26, 2015. It has been reproduced with permission from the newspaper and the original author. Benjamin Cordy is a neurobiology student at UW, he is also the Editor-in-Chief of Grey Matters Journal – an undergraduate neuroscience journal whose mission is to educate the public and develop effective science communicators. On Saturday hundreds gathered in Red Square to voice their opposition to scientific research. At its core, this is the true message of the animal rights movement, which believes that research should never rely on animal models. The march on UW was about stopping science altogether. Is this really the best move for society? PeTA complains that the scope of animal research is growing. It’s the success of our research that spurs this growth, and society benefits enormously. Here, in a blog post featured on the Speaking of Research website, I argue why we should all be thankful for this expansion. What do multiple myeloma, influenza, advanced breast cancer, atrial fibrillation, thyroid cancer, ear infection, advanced ovarian cancer and obesity all have in common? One commonality is obvious – they cause suffering, sickness and sometimes death in people around the world. Another commonality is less obvious – these are each conditions that are now being treated with new drugs just approved by the U.S. Food and Drug Administration (FDA) in the past three months alone. That’s right… in the period from Thanksgiving 2014 until now, new drugs that treat each of these conditions have become available, and these agents will be used to treat the illnesses that may affect millions of Americans. Eventually, they will likely have enormous worldwide impacts on these diseases. That’s something to be thankful for. It has been more than 5 years since my car was bombed by radical animal rights fanatics who knew nothing meaningful about my research but were opposed to it anyway. Sometimes, it feels like just yesterday. Sometimes, it feels like a story from another, distant life. Fighting non-stop against the lying thugs who have targeted me has, at times, taken every bit of strength I had. The fight has threatened to compromise my scientific research by draining my time, my motivation and my passion. Fortunately, I stayed as strong as I could and pushed through. I look back on the most recent 5 years and feel that I have accomplished more scientific progress than I ever expected of myself and know that animal rights bullies have not had the effect that they wanted. In short, they have failed. But my battle is not unique, and today, the animal rights scourge is not backing down. Indeed, they are determined to have an irreversible impact: one investigator at a time. PeTA, the Humane Society of the United States and garden variety animal rights thugs across this nation are working hard to ensure that their influence is strong and effective. At this very time, neuroscientists in Minnesota, Wisconsin and Maryland are the targets of sustained and withering campaigns, ranging from false allegations in the media, to illegal home demonstrations, to despicable online campaigns of hate and vitriol. Picketers demonstrating in the street in front of a researcher’s home. Each of the investigators is a world-renowned scientist whose work has fundamentally transformed the way we think about the relationships between brain and behavior, in both health and disease. In each case, their research necessarily involves non-human primates and addresses addictions, alcoholism, anxiety disorders and depression. In essence, their collective effort – which involves a relatively small number of animals – addresses the life-changing disabilities faced by more than 2 billion people alive today. This is not niche research – it is work that touches the lives of virtually everyone. Mental illness is a matter of personal concern for everyone: whether it affects us directly or afflicts someone we love. A vervet monkey living in a social enclosure at my laboratory at UCLA. These scientists have given their professional lives over to addressing some of the most disabling illnesses that face humanity. 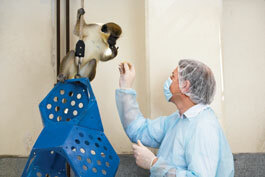 Their work requires animal models and is conducted in a responsible and humane way. When animal rights thugs have demanded that their research be investigated, the results have been the same – these costly and time-wasting “investigations” have revealed nothing but that the researchers have followed all the ethical standards that society expects of scientists. And in return for taking on the most critical problems imaginable in a responsible way – they are being treated in an ugly and reprehensible fashion by animal rights fanatics who label the work useless and evil. Surprisingly, there has been a limited response from the scientific community. The American Psychological Association, whose membership is made up of many of the nation’s top psychologists who study and treat mental illness, came out in strong support of one affected investigator. The leadership at the NIH, including some of the most influential scientists alive today, have as well (here and here). But other scientific societies and individual scientists have been largely silent. It is long past time for scientists to stand up in public and open defense of their colleagues. It is long past time to act in the interest of a community that has made scientific progress possible. It is long past time to do more than privately support our colleagues and then move on with our lives. Use social media to let the University of Minnesota’s President Kaler (@PrezKaler), University of Wisconsin’s Chancellor Blank (@BeckyBlank) and NIH’s director (@NIHDirector) know that you support the life-saving research that is going on in their animal research labs. Let Congresspersons Lucille Roybal-Allard (@RepRoybalAllard), Dina Titus (@repdinatitus), Sam Farr (@RepSamFarr) and Eliot Engel (@RepEliotEngel) know that they should retract their calls for an investigation of non-human primate researchers and instead support this vital research. Ask the scientific societies to which you subscribe to make public, forceful statements in support of non-human primate research and those that conduct it. Of particular importance are the American Association for the Advancement of Science, the Society for Neuroscience and the Federation for American Societies for Experimental Biology. Respond to comments from animal rights extremists on websites and news stories by noting that the research is humane and responsible and of the highest scientific caliber. And express your support directly and earnestly to the affected scientists and find out what they think you can do to aid the cause of ending the harassment they are receiving from animal rights groups. Today’s guest post is by Dr. Cindy Buckmaster, chair of Americans for Medical Progress. Activists at the Beagle Freedom Project (BFP) continue to gather support for their agenda to end animal-based research – and some in the research community are unknowingly helping them. Many of you have seen recent TV news items or read news articles that feature beagles said to have been saved from laboratories where they never had a toy, played with other dogs, or experienced kindness and love from people in research settings. The Beagle Freedom Project uses the limitations of the news media to create this one-sided and false impression of the lives of research dogs. The following is a repost of an OpEd piece that I wrote and that was published in the Daily Bruin on October 28, 2014. At UCLA, we endeavor to teach you – our students – the knowledge and skills that you will need to contribute to a better world. For many of you, the experience on campus is not complete without playing a deep role in transformational research. But in addition to your contributions to scientific exploration, we encourage you to take on the heavy duty of participating in public life to help society make important decisions based on facts and rational judgment: Should we vaccinate children? Is the Earth really warming up? Is it necessary to explore our solar system and outer space? Should we use animals in medical research? These are just a few examples. But some people are working hard to ensure that your voice is never heard. 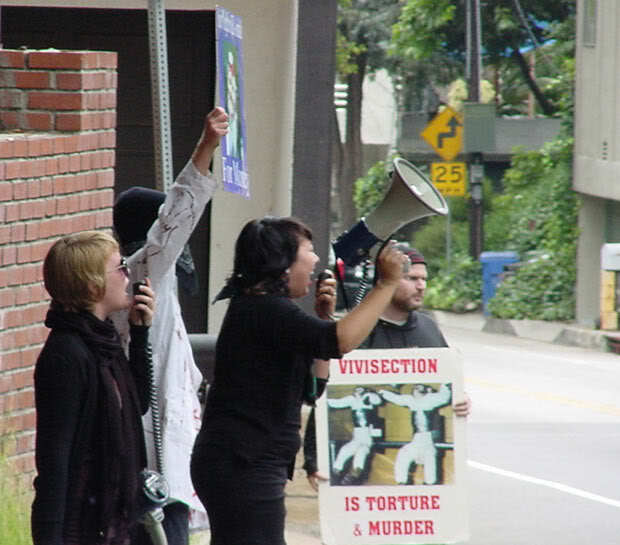 A recent Daily Bruin article, “Animal rights activist groups target student vivisectionists,” which was published on Oct. 23, indicates that animal rights groups are trying to target students who participate in life science and medical research at universities in the U.S. and the U.K. that involves experimentation on animals. They are opposed to this research, despite the fact that it is crucial to medical progress, well regulated and ethically justifiable. Having failed to use reason and civil debate to adequately advance their ideas with the broader public, they now quite cynically opt to offer rewards to those who expose student researchers, thereby enabling the intimidation and harassment of those identified. Their obvious goal is to harass you out of your studies and research and to prevent the future that will lead to new therapies and cures of tomorrow. I know their tactics well, because for more than five years, animal rights activists have worked day and night to suppress my voice and my research that deals with the causes and treatments for addictions. They firebombed my car. They sent me razor blades in the mail. They have harassed me and my loved ones with endless home demonstrations, where they scream their threats and obscenities. They want to ensure that I am unable to express my humanity, my ideas and my work. They believe their right to speak stands above those of others. All Bruins should unanimously reject such hateful behavior. You should feel proud to be contributing to science and understand that you never need to fear exposure for selflessly engaging in essential scientific research. Like me, I am sure your friends, your family and your peers understand that you have made personal sacrifices to make sure that scientific research improves the future for all mankind. You are a good person who chooses to improve the world through science and knowledge, rather than through hatred and anger. Destruction is easy. Creation, discovery and progress can be hard. But creation cannot be stopped. Animal rights groups may be able to prune the flowers, but they’ll never stop the surge of the spring that comes from our tireless and noble work.